Don’t you just love all white? Its simplistic, yet bold while remaining classy and chic! 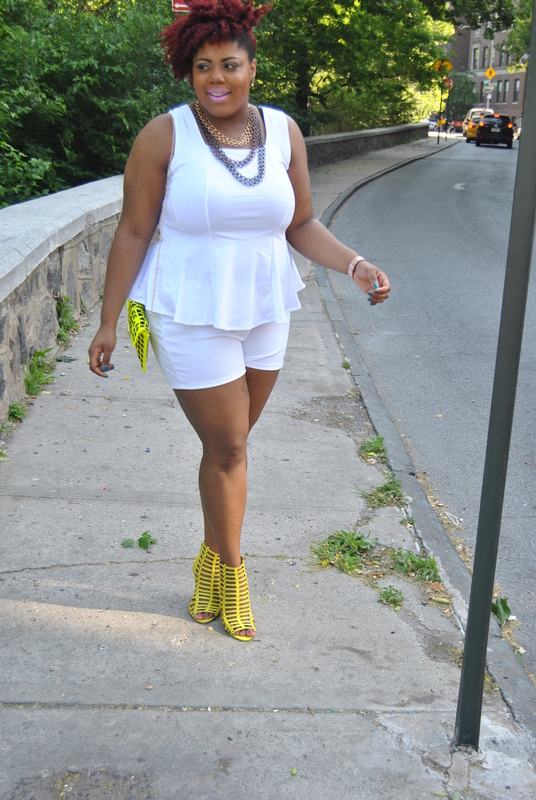 Its Full Figured Fashion Week here in NYC & last night I attended the “Curves at Sea” all white boat cruise. When planning my look for this event I knew I wanted to wear a pepulm romper. I searched everywhere, but I couldn’t find the perfect one. So, i decided to create a “romper” look. I styled a pair of simple nylon shorts and a sleeveless peplum top. I wanted to accessorize with a splash of color, so I chose neon yellow to give my look the perfect “pop!” The strappy gladiator wedge sandal made an edgy statement. I am a huge fan of matching purses and shoes. This neon cut out clutch has been everywhere in every color this spring. Neon colors are definitely a hot summer accessory color! The cut out design was the perfect compliment to my shoes. I finished my look with a three trained statement necklace.